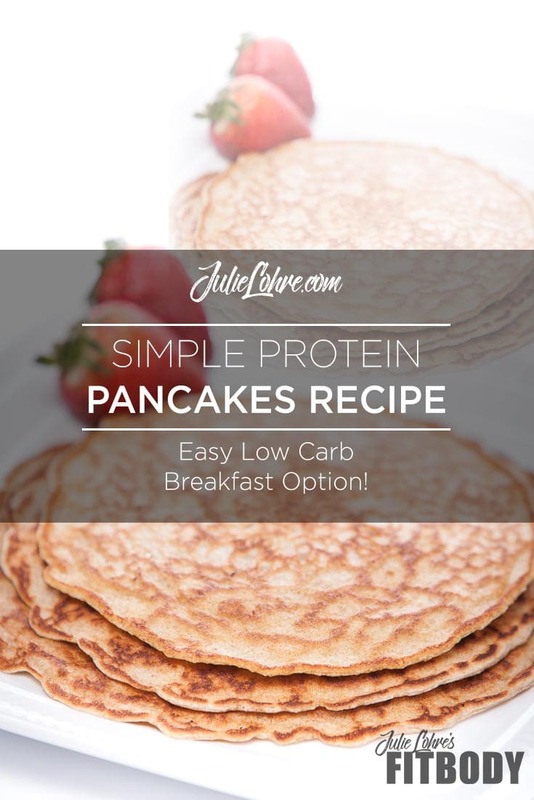 Light & Fluffy Simple Protein Pancakes Recipe and Easy Low Carb Breakfast! 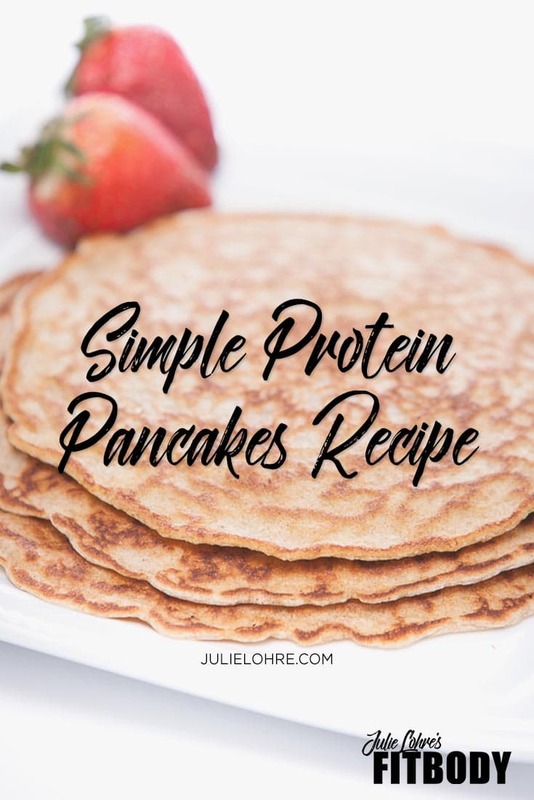 Light & fluffy, this simple protein pancakes recipe makes a super easy low carb breakfast in no time at all! With a balance of egg whites, vanilla protein powder and whole wheat flour you can make up these low-fat and low-carb pancakes the night before and enjoy first thing in the am with your favorite toppings! I believe that flexibility and variety are super important when living a healthy lifestyle and I try to live that with the foods I eat. Despite trying to minimize my carb-intake, I still believe in moderation and want my food to taste great! There are times where you just crave something hearty for breakfast like pancakes, instead of just string cheese, a vanilla protein shake or fresh fruit. A stack of "normal pancakes" topped with tons of butter, chocolate chips and maple syrup might taste good, but would blow my entire day’s worth of carbs and calories for that matter out of the water. So I wanted to come up with something equally filling but much healthier. I have seen versions of healthier versions with bananas as a prime ingredient, but they seemed really dense and unappealing. After years of searching for that ideal healthy low carb breakfast, I decided it was time to experiment and come up with the perfect recipe that tasted great, but was also super simple to make at home. Now that is a true feat! So, I started digging deep. I pulled out an old cookbook made for me by my mother-in-law and found her traditional old fashion pancake recipe. With ½ cup of this and a pinch of that, she had a wonderful recipe that had her flipping and cooking a family favorite for years. So, I started with that as my base. 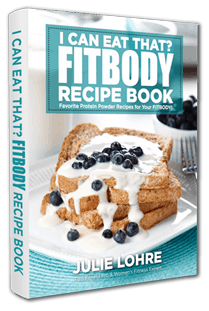 I replaced some of the higher calorie ingredients, added in my favorite whey protein powder and flax seed for a balance of protein and healthy fats along with the complex carbs and voila! Pancake perfection! Top it with fresh berries or some decedent toppings like peanut butter, almond butter or chocolate chips and you have yourself a real treat. I hope that you love this light and fluffy breakfast as much as my family does! Combine all dry ingredients together in a large bowl and mix to throughly combine. I like to use a large measuring bowl and spatula. Add egg whites and almond milk to the dry mixture. Mix together to form a batter consistency. For thicker pancakes, you can use less almond milk, for thinner protein pancakes, you can add either more almond milk or extra water. Spray skillet or griddle with a bit of Pam Cooking Spray. Pour out enough batter to make a 4-5 inch pancake. Cook until the top forms small bubbles then flip over and continue cooking on the other side. Tops should turn golden brown when done.